It was learnt that Adesina, who hails from Ekiti State, was arrested on Tuesday by the Alakara Police Division on Alowolodu Street in the Alapere, Ketu area of Lagos State. Akorede had further explained in the letter that when he confronted Adesina, the doctor allegedly claimed to be a consultant gynaecologist with LUTH, adding that he (Adesina) brought the referral cases from the hospital to his house so that he could have time to attend to them. Punch Metro learnt that the LUTH authorities, who could not find such name in the record of their consultants, forwarded the letter to the police, and Adesina was thereafter arrested. Punch correspondent observed that the certificates included a fake MBBS certificate of the University of Ibadan, and a fake membership certificate of the Nigerian Medical Association. Speaking with Punch Metro, Adesina said he paid N100,000 to one Kolawole in Ibadan, Oyo State, to get the certificates, adding that he had used them for only three years. 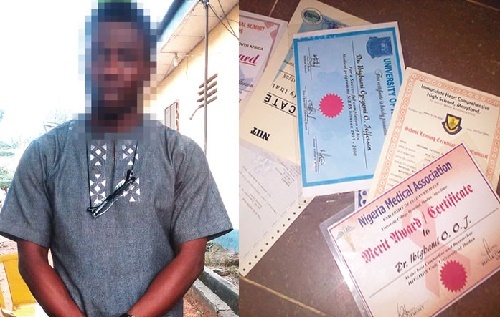 He said, “I bought the certificates from Kolawole in Ibadan. That was three years ago. I bought them from him for N100,000. He printed the seven certificates. The suspect’s wife, Olawumi, pleaded that her husband should be released as he had realised his mistake, and would never venture into such again.